In the last article, Chef Eric shared his recipe for his daughter’s favorite dish, Crab Cakes. Now to show he doesn’t have any favoritism in his family, he will be sharing his son’s favorite dish, Sweet and Sour Pork Belly! 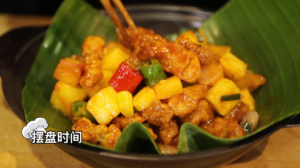 Sweet and Sour Pork is a Cantonese dish. At that time that it started, there were many westerners coming to Guangzhou. They liked Chinese food. One of their favorite is Sweet and Sour Pork Rib, but they didn’t enjoy the bone. The Chinese chefs then took out the bone and it became today’s Sweet and Sour Pork. In this recipe, Chef Eric will be using marbled pork meat to create this mouthwatering dish! First use the knife to remove the white top layer of the meat. Then cut the meat into ½ inch cubes. Add a dash of salt sugar, pepper and a tablespoon of sesame oil on the meat. Pour your whisked egg and mix the meat thoroughly. Leave it for 15 mins. First remove the top and skin. 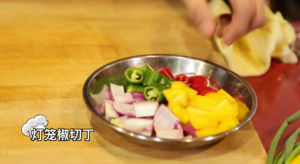 After removing the top and skin, cut the pineapple to ½ to 1 inch chunks. Cut your onions, green chili, red chili and capsicum to approx. ½ chunks. Dice your spring onion. Chop your clove of garlic finely. Just cut a slice of the orange and lemon, it will be squeezed later. 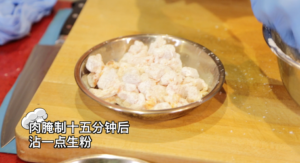 Fill a bowl with corn starch and mix the meat thoroughly so that is coated with the flour. You can tap the meat on the side of the bowl to get rid of excess flour. 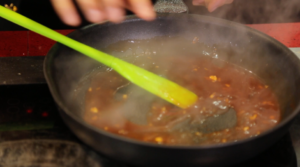 Pour the cooking oil to half the metal frying pan, and turn to medium-high heat. When there is a little smoke you can start putting the pork in the pan. Remove when the meat starts to float. After letting the fried meat sit for a 2-3 min and then refry the meat. Refrying makes the outside crispier. Add all the vegetables first except for the spring onion. After 1 min add the spring onion and fry till fragrant. 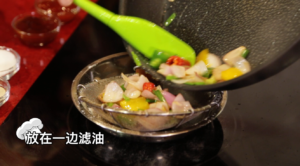 Place the vegetables in the sieve to filter the oil when done. and 100gm of Worcestershire Sauce. 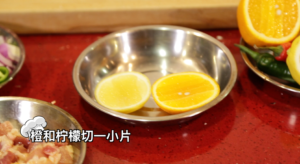 Squeeze your slices of lemon and orange. Taste the sauce and if it’s too sour you can add sugar. 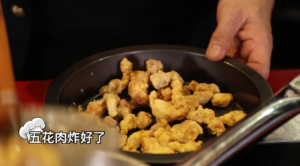 Add the pork and pineapple into the frying pan and mix it thoroughly. There you have it, you have made Chef Eric’s Sweet and Sour Pork Belly! Tell us how it taste below! Next articleOld & Authentic Taste Yong Tau Fu: OLD SCHOOL Yong Tau Fu!